Austin, you've been a HUGE help to my build. I picked out the materials from what you sent me (free by the way, THANK YOU!) and will get to that once the fabrication (he's lagging bad on this) and wiring (uhh, scary, that's my work), is all done. Interest in black cloth/alcantara stock seat cover. How much for cover of both seats? Some more pics of mine under different light so the color can be better compared. The old seats were darkened due to age I guess, on the sides you can see the OE leather is lighter and more closely matched to the alcantara I chose. 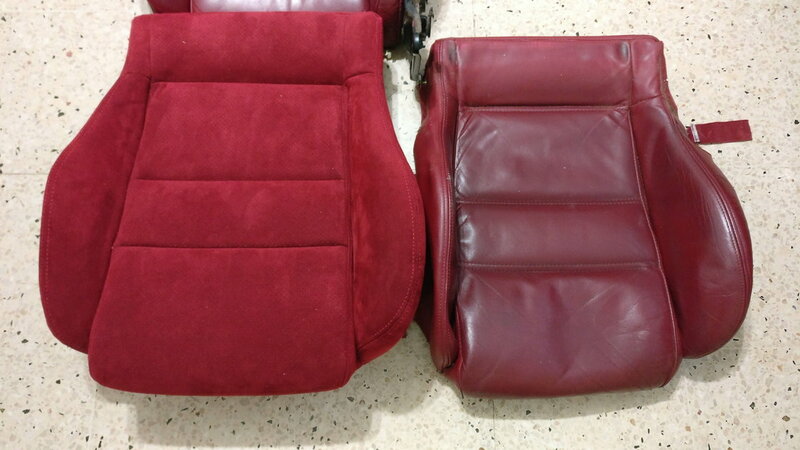 I like those red recaro seat cover but is it possible to have it wrinkle free after installation? Yes and No. Racing seats are a unique beast because they have attachment methods different than most factory seats. 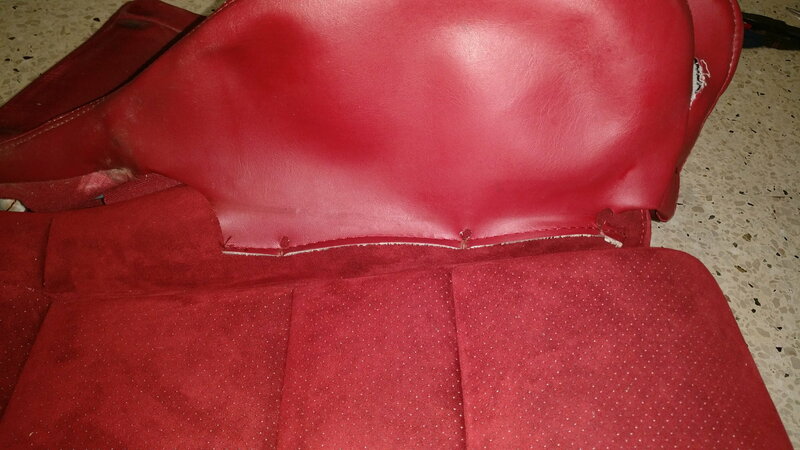 The Spirit R seats use all velcro to hold the cover in place and then a tension wire around the outside. 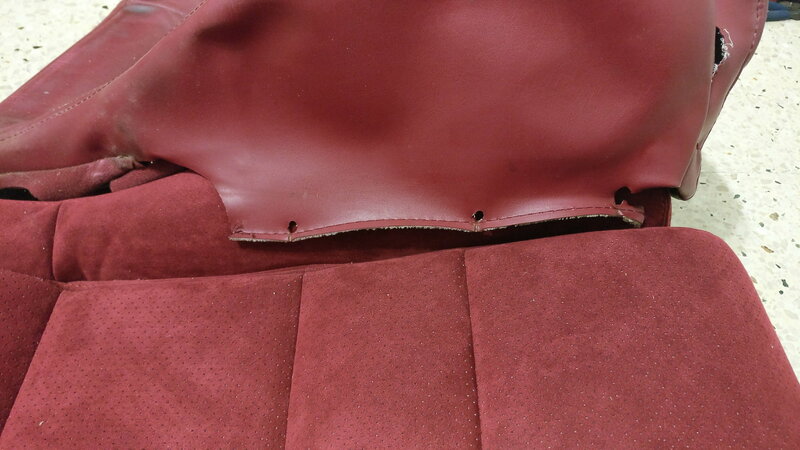 The velcro attaches to cloth material which is glued to the seat shell. 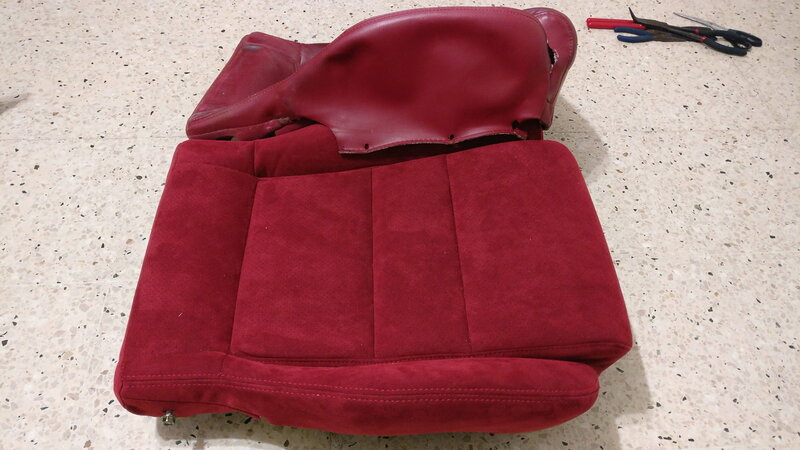 Using this method it is difficult to get the seats to look "perfect" with absolutely no wrinkles because you a relying on the strength of the velco to cloth bond or the cloth glued to the shell bond. Which ever is the weakest. The cover does not always hold exactly in the position you want it to because of that. 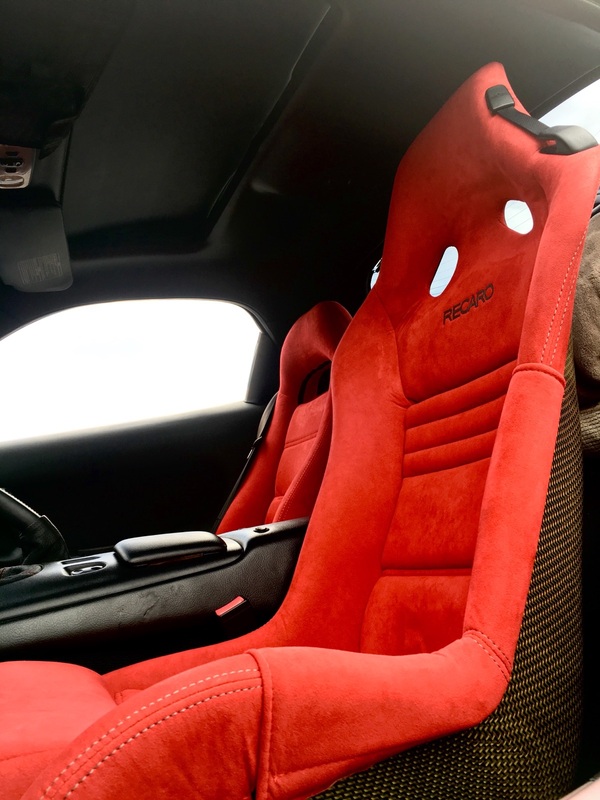 The other factor you have is that alcantara has different characteristics than the OE materials you see used on most racing seats. 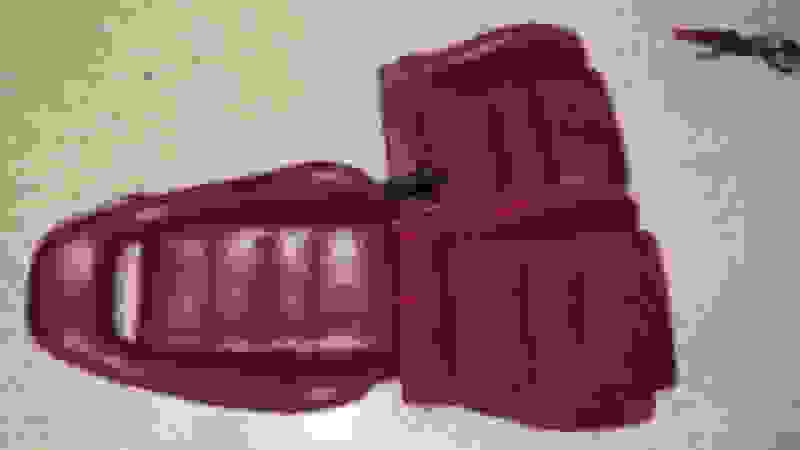 The OE materials are very thin, which allows them to stretch very well and avoid wrinkles while also not putting a ton of tension on the velcro attachment points. This is also the reason that it wears out quickly and also fades significantly. The alcantara is an upgrade in material quality, with the slight trade off in work ability compared to OE. These seat covers also require assembly in the proper sequence in order to minimize wrinkles. We have installed covers and seen customers use other professional shops to install with great results. We have also seen covers that show a little more wrinkles because they were done by the customer or a shop with less experience. So, that is a variable that comes into play also. Our patterns are designed for the use of the alcantara material specifically. We modified the OE patterns in order account for the material changes in certain areas. This is also the reason we have not done a set in leather yet, though we have had the request. It would take further patterning and changes in order to account for the differences in the material work ability to generate a set of covers that would install with minimal wrinkles in leather. Austin, great response, I'm wondering if you plan to do a video tutorial on how to install these seat covers properly or with your experience and knowledge? Reason I ask is that I'm located in Australia so can't bring my seats to you, but would like to buy a set of covers in future. I plan to install the covers myself, but a little worried I might damage something in the process. Yes, i have always planned to do a tutorial of the install. It just seems when ever i have a set of seats here to actually do an install on, time does not allow for us to do it. 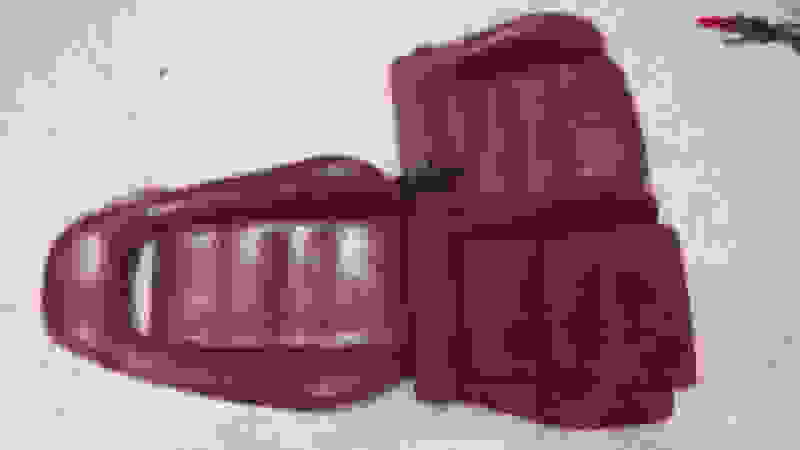 If i can find a local that needs a set reupholstered, we can do it very soon. Austin, how difficult is it to swap out the covers for R1 seats? PM me a price for the covers when you have a chance please. I'm in Torrance, ca zip is 90505. Thank you Sir. 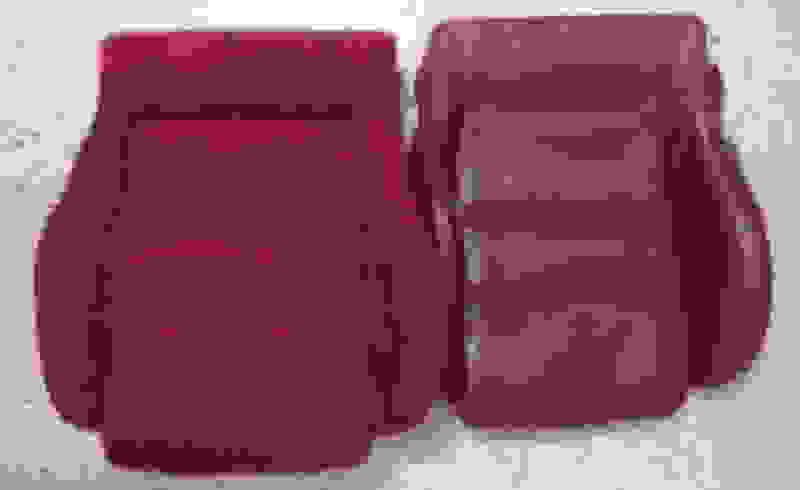 Austin, I am also in southern CA 93551 and interested in R1 (black alcantara/suede) seat covers. Maybe two pair will help with pricing? Thanks. price for a set for fd3s seats? not the recaro once.. I hope to get the thread going early next week for the group buy. Pricing will be finalized in that thread. Yes, we can make a kit that a customer can install themselves. Most of the materials we use are actually not flame retardant. The type of alcantara we use is not. You are correct though, alcantara is available in a flame retardant version which is used heavily in aviation applications. The foam we use is not either. Again, we do have access to flame retandent versions of our foam, it is just triple the cost. Alright guys, this has been a long needed post, we were just waiting until everything was finalized. At the end of this year, we will be closing ESH Upholstering. My brother, who is the other owner and I will be making a transition into another business, still in the automotive field. We still plan to produce the products that we make which includes the RZ recaro covers, non bose privacy covers, and non bose trunk carpets. We will not be doing custom orders for anything else from here on out though. Eventually, if time allows, we will offer some of these services again. But, this will not be the primary focus of our efforts moving forward. We will remain a vendor and continue to offer our limited services here on the forums. If you need any of the products we offer, feel free to contact us through the forums here or also you will see them on Ebay. We appreciate the support over the past few years and look forward to helping out as we can with members interior projects in the future! Sorry to hear you're closing, but glad to hear you're sticking around. I have a set of RZ seats and I'm curious what the wait time right now would be for a new set of covers? Austin, I can't seem to send you a PM, but wanted to ask if non-Bose trunk carpets are still available and where I can see more info. Quick Reply: Introduction & Product Development for Interior Upholstery! !